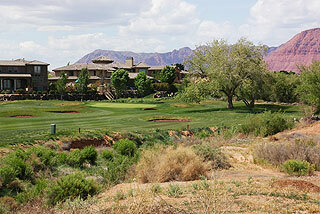 Sunbrook Golf Club in St George is a 4-star (Golf Digest Places to Play) Ted Robinson/John Harbottle design featuring three disctinctive nines that offer challenging golf and spectacular beauty. 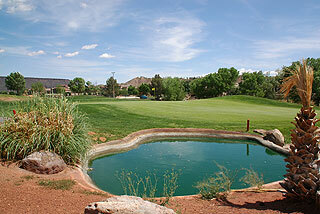 On property is a wonderful practice facility with grass range, putting green and short game area with sand bunker. 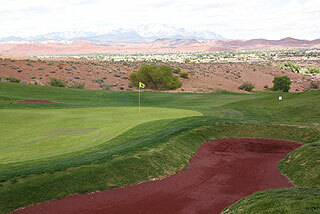 The red sand featured in 60 some bunkers on the 27 holes is quite unique - a crushed volcanic rock that is great aesthetically, and also very playable. The clubhouse includes a pro shop plus snack area with beverages and hot/cold sandwiches available. Each nine features sprinkler heads that are measured to the center of the green, yardage blocks every 25 yards from 200 to 75 yards (from 250 on par fives) and boulders are positioned on the sides of the fairways at 150 yards. There also are hole diagram booklets for each nine, with hole designs, yardages, hazards and tips on how to play each hole. 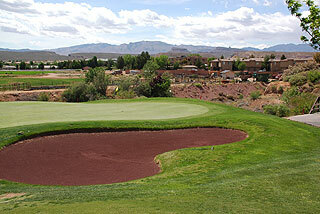 The Bermuda fairways and greens are over-seeded with rye each fall, providing nice playing surfaces all year long. We played the Woodbridge and Pointe nines on our visit, and also toured the newest layout of the three - Blackrock - to provide some photos (last 4 in this review). The Woodbridge features 22 sand bunkers plus water hazards on 4 of the holes, and plays to a par 36 with yardages measuring 3482, 3293, 3106 and 2681 yards for the four sets of tees. There are some very interesting and tightly wound holes on this nine, including the beautiful par three 4th, which plays from an elevated tee to an island green - the only island green in Utah! The fifth is perhaps the toughest hole on the course - a long par four that plays from high up on a hill, to a fairways presenting a narrow landing zone. The tee shot and approach must navigate a ravine plus a menacing river that shapes the hole. Number nine is also memorable, a long dogleg left par four that plays uphill to a putting complex protected on the left by a landscaped pond. The Pointe also features extreme elevation changes, most notably the tough par four 6th, which plays downhill around a mountain - with a pond right of the green creating one of the most challenging approaches on the course. The short par four 5th is also spectacular - a true risk/reward hole over a canyon, that can make or break a round. The seventh finishes a tough three hole stretch, as water borders a peninsula fairway, making accuracy a must from tee to green. 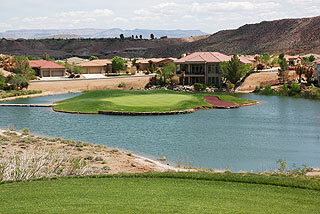 The Pointe nine was our favorite of the group, and plays to yardages measuring 3397, 3179, 2986 and 2604 yards. 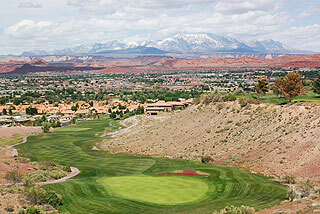 Blackrock also presents 4 tee areas, that play to distances measuring 3384, 3145, 2942 and 2493 yards. This nine is unique in that several holes (numbers 6, 7 and 8) play along and trough rugged black rock lava fields - hence the name. Hit a ball in these sharp, rocky crags and leave it to its fate - attempting to retrieve it may result in bodily harm. On this course, the par three 8th is particularly challenging, especially from the tips as it plays uphill over a lava field from 197 yards away. We found Sunbrook (at $70 including cart prime time in 2008) to be one of the best values in the Vegas/Mesquite/St George region. There is great variety inherent in the three nines, the course was in great shape on our late December visit, and service was friendly and efficient. 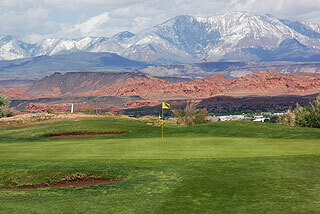 We highly recommend a round here, for those visiting the St George/Mesquite area. 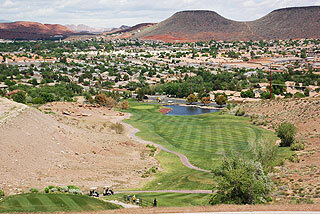 For more info, visit our page for the course on our Mesquite/St George golf site by clicking here.